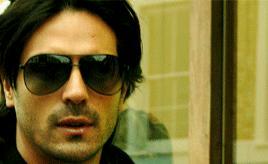 Arjun Rampal’s office is in a most unlikely Mumbai neighbourhood. Not in a by-lane of Bandra or a high rise in Andheri or even in a bungalow in Juhu. It is, in fact, in the quiet, leafy and extremely un-Bollywood locale of Dadar Parsi Colony. But one look at the building name explains it: Jesia Building, obviously a connection to his wife Mehr. The day we meet, Rampal is gently ramping up his day, following an all night shoot for Nach Baliye, the actor’s foray into television as a judge on the reality show (more on that later). On the coffee table lies a laminated blow up of a five star review of hit film Rock On. Rampal, who plays the brooding and disappointed guitarist Joe Mascarenhas in the film, earned largely complimentary reviews for his performance which was respectably followed up by his portrayal of movie director Siddharth in Rituparno Ghosh’s The Last Lear. Along with the positive reactions he received as the negative character Mukesh Mehra, the crooked producer in Om Shanti Om, Rampal has turned a significant corner in his career. Rampal is now referring to his production company, Chasing Ganesha Entertainment, which launched with feature film I See You in 2006 and is now flirting with the idea of branching into television software production. His next movie production is likely to be an action movie on which work will start sometime next year.